If you’re one of the 44 million Americans responsible for repaying $1.4 trillion in student loan debt, a single-page memo Secretary of Education Betsy DeVos sent earlier this month might mean more to you than you realize. In the memo, DeVos rolled back two Obama-era mandates. The first mandate was intended to make loan collection more transparent and efficient for borrowers. The second aimed to make sure student loan servicers who provided poor customer service didn’t get first pick of new (and lucrative) government contracts in the future. Both mandates might sound like good things. The student loan lawyers we talked to don’t understand why DeVos is rescinding them. 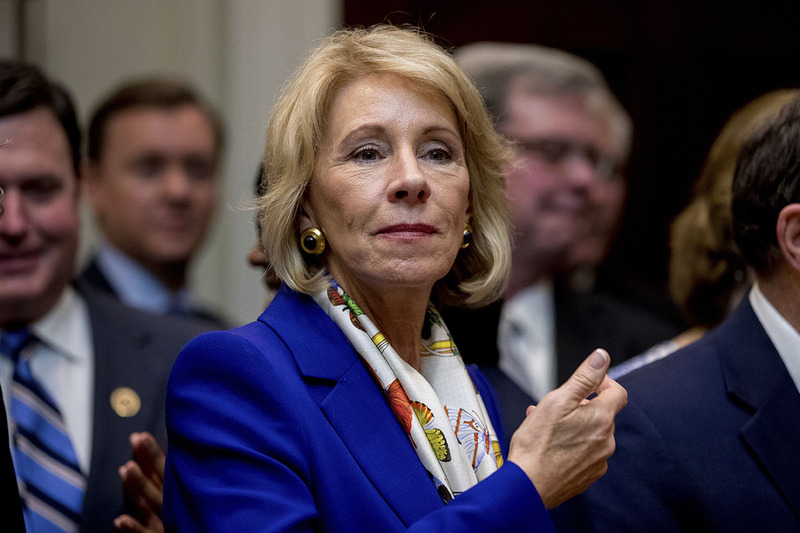 And earlier this week, a coalition of 21 state attorneys general — all Democrats — criticized DeVos’ decision to reverse the policies aimed at protecting borrowers, The Washington Post reported Monday. DeVos provided no further explanation and did not offer up any new solutions. Before we can understand why DeVos’ actions are such a big deal, it’s important to understand the issues with the way servicers currently collect student loan debt. Borrowers don’t make their payments directly to the Department of Education. Instead, they work with servicers like Navient, Great Lakes Educational Loan Services and Nelnet, which serve as third parties that collect and manage your loans. The problem is that borrowers with multiple loans might deal with multiple servicers, which can make it difficult to keep track of their loans and pay them off. Additionally, borrowers don’t get to choose their servicers, and their experiences can vary widely with each company. “What the Obama administration wanted to do was create one online servicing portal for all of the servicers to use and under that new system, it wouldn’t matter who a borrower’s individual servicer was,” said Jay Fleischman, a California student loan attorney. The new process was also supposed to make it easier to report complaints, provide feedback and resolve issues faster by allowing borrowers to communicate directly with the DOE rather than their servicer. “By rescinding those policy memorandums, what Secretary DeVos and the Department of Education are saying is, ‘We’re abandoning that ideal. We’re abandoning the idea that the borrower is entitled to greater transparency, greater accountability and more information with respect to their ability to repay their student loans and the options that are available to them,’” Fleischman added. Tough critic. And he’s not the only one. Navient recently came under fire for saying borrowers can’t rely on it to counsel them about their repayment options, as its primary role is to collect payments. Navient made that statement in a motion to dismiss what could be a multibillion dollar lawsuit, despite previous public statements the servicer made saying it was a resource for borrowers. DeVos’ memo made it easier for Navient to continue receiving government contracts without further scrutiny into its past student loan management, according to Adam Minsky, a Boston student loan attorney. Included in Minsky’s criticism was a previous memo DeVos sent that rolled back yet another Obama-era guideline. That memo reinstated additional collections charges for borrowers who default on their loans. Based on the explanations from Minsky and Fleischman, the future for borrowers seems uncertain. But there are things you can do to protect yourself. When you call your servicer, you have to understand that the person on the other end of your call “is not looking to help (you) at all,” Fleischman said. Instead, log in to StudentLoans.gov. There, you will find your full student loan history so you always know exactly how much you owe, how many loans you have and what interest rates each loan carries. You can also get detailed information directly from the DOE on everything from loan deferment for financial hardship to requirements for loan forgiveness. The information you find here is trustworthy. Also on StudentLoans.gov, there is a repayment estimator with a wealth of information, Fleischman said. While you can use it without logging in to see estimated numbers based on national debt averages for people with your education level, it becomes far more useful once you log in. The estimates disappear, and you can make calculations based on your real income and debt. The estimator uses your adjusted gross income, family size and living arrangements to determine how much you can afford to pay. It then uses your information to break down all the options that apply to you. Drop-down menus also detail the terms of each payment option: how long it will take to repay your loans, how much you will pay over time with interest and at what point you will be eligible for forgiveness, if applicable. The payment options include the standard 10-year repayment schedule, income-based repayment, a pay-as-you-earn plan and several others that populate if they apply to you. If an option does not apply to you, the calculator makes that clear, too. If you must communicate with your servicer, make note of everything the representatives tell you, and get it in writing whenever possible. According to Minsky, it’s even a good idea to keep a copy of forms you fill out because some servicers may not keep them on file. Minsky also suggests speaking to management and, whenever possible, keeping track of who you have spoken with in the past and requesting to speak to the same person every time you call. When searching for an attorney or counselor to give you advice about your specific situation, make sure the person you seek out is in good standing with appropriate governing body, like the state bar association. Before hiring an attorney, make sure to check them out online and speak with them either in person or over the phone to make sure you feel comfortable working with them. Finally, always double-check the information they give you, and be weary of anyone who offers lofty promises of immediate loan forgiveness. If a promise seems too good to be true, it likely is. When you have a problem with a servicer, you should file your complaints directly with the DOE rather than just with your servicer, according to Minsky. That is generally the best way to get problems resolved quickly. You can do this after registering at StudentLoans.gov. Head over to the feedback section of the site, where you can file a formal complaint about a servicer or student loan collections. You can also use this portal to file complaints about applying for and receiving federal loans, grants and work study. This is also where you’d complain about a school’s administration of federal student aid and misleading recruitment or marketing practices. Once you file your complaint, expect to hear back from the DOE within 15 days and have your resolution within 60 days. The DOE should also give you a case number to use for reference when you communicate with its representatives. Your Turn: Have you ever had issues with a student loan servicer? If so, was it resolved? Desiree Stennett (@desi_stennett) is a staff writer at The Penny Hoarder. She is one of the 44 million Americans with student loan debt.